• General term for a number of inherited defects of amino acid metabolism in which there is a deficiency or absence of pigment in the eyes, skin, or hair. • A group of genetic conditions marked by little or none of the pigment melanin in the skin, hair, and/or eyes. People with albinism may have vision problems and white or yellow hair; reddish, violet, blue or brown eyes; and pale skin. Several genes have been found to be responsible for albinism. The current classification of albinism is determined by the affected gene, making the previously used terms, “partial or complete” and “tyrosinase-positive or tyrosinase-negative” obsolete. The gene for tyrosinase ( TYR ) on chromosome 11q14-21 and the P gene on chromosome 15q11.2 are the most commonly affected genes; mutations on these genes cause oculocutaneous albinism type 1 (OCA1) and oculocutaneous albinism type 2 (OCA2), respectively. • Other types of albinism occur more infrequently, including those associated with systemic manifestations, such as Hermansky-Pudlak Syndrome ( Hermansky-Pudlak Syndrome; bleeding disorder due to absence of dense bodies in platelets) and Chédiak Higashi syndrome (immunodeficiency and neurologic problems). The TLDA or Tyrosinase Lack-Depending Albinism, in which there is the mutations of the tyrosinase gene ( TYR ), results in OCA1. Albinism can affect people of all ethnic backgrounds and has been extensively studied. Approximately one in 17,000 people have one of the types of albinism. This suggests that about 1 in 70 people carry a gene for OCA. Prevalence of the different forms of albinism varies considerably worldwide, partly explained by the different founder mutations in different genes and the fact that it can be difficult clinically to distinguish between the different subtypes of albinism among the large normal spectrum of pigmentation. OCA2 is the most prevalent form worldwide. In particular, OCA1 is transmitted in an autosomal recessive manner and it is expressed in males and females with the same frequency. Photobia may characterize the disease of some patients, sometimes even in a very important way. Iris translucidity is demonstrable by slit lamp examination. One of the features that is mainly linked to OCA is the misrouting of the optic fibers, consisting in an excessive crossing of the fibres in the optic chiasma, which can result in strabismus and reduced stereoscopic vision. The abnormal crossing of fibres can be demonstrated by monocular visual evoked potential. Absence of misrouting excludes the diagnosis of albinism. Delayed visual maturation has been reported in albinism. It is not unusual for parents of an infant with albinism to note poor fixation on faces and objects and a delay in visual development. Nystagmus (involuntary, rapid, rhythmic movement of the eyeball) typically develops by 6 to 8 weeks of age and is initially slow with a large amplitude, but the amplitude typically decreases within the first year of life. • In OCA1A the hair, eyelashes and eyebrows are white, and the skin is white and does not tan. Irises are light blue to almost pink, and fully translucent. Pigment does not develop and amelanotic nevi may be present. The symptoms do not vary with age or race. Visual acuity is 1/10 or less, and photophobia is intense. • In OCA1B, the hair and skin may develop some pigment with time (after 1 to 3 years), and blue irises may change to green/brown. Temperature-sensitive variants manifest as having depigmented body hairs, and pigmented hairs on hands and feet due to lower temperatures. Visual acuity is 2/10. This phenotype was previously known as yellow albinism. • The other OCAs have a mild symptomatology, although OCA2 may reach a visual acuity of 3/10. The skin pigmentation is reduced but not as reduced as OCA1A, and the degree of pigmentation is very variable. OCA2 is characterized by light brown hair and skin, and gray irises in Africans, while OCA3 is associated with the red pigmentation of the hair and the reddish-brown skin (xanthism). The OCA3 doesn't show visual anomalies because the hypopigmentation is so mild that the correct development of the optical system is saved. The diagnosis of OCA is based on clinical findings of hypopigmentation of the skin and hair, in addition to the characteristic ocular symptoms. A study showed that patients with albinism had a corneal reflex deviated nasal to the center of the pupil, known as a positive angle kappa. Prism and alternate cover test at a more rapid rate than usual (to diminish effect of increased nystagmus amplitude with monocular occlusion) often discloses strabismus. Because of the positive angle kappa, an esotropia may be masked or appear diminished in amount on causal gaze, compared with the measured deviation, whereas an exotropia may appear larger than measured. Examination of the fundi typically shows that foveal development is absent. A few patients with albinism, who have vision 20/50 or better, have some rudimentary foveal development, and some thinning of the retina in the foveal area has been demonstrated with optical coherence tomography. • grade 3, opaque macula so that choroidal vessels are not visible. presence of melanin pigment in the macula correlates with better visual acuity. Albinism is a disease in which there is a reduction of the production of pigment in the skin, hair and eyes. This pigment is called Melanin which is a large biopolymer derived from the progressive oxidation of the amino acid Tyrosine in the absence or in the presence of sulfhydryl groups from cysteine, giving rise to black-brown (*eumelanin*) or yellow-red (*pheomelanin*) compounds, respectively. Its biosynthesis occurs in specialized cells called Melanocytes and retinal pigment epithelium (RPE). The former derive embryologically from the neural crest and then migrate in several organs and tissues, including the basal layer of the epidermis, where they play a critical role in photo-protection and camouflage, the eye (choroid and iris stroma), the inner hear, and the leptomeninges. In contrast, the RPE derives from the neuroectoderm, similarly to the neurosensory retina, and is situated behind the photoreceptor layer in the posterior segment of the eye, but also extends anteriorly to form the innermost part of the iris, becoming the iris pigment epithelium (IPE). The RPE is implicated in photo-absorption, provides structural and functional support to photoreceptors, and - last but not least - plays a fundamental role in the development of the retina and visual pathways. Tyrosinase is localized on chromosome 11q14-21 and the coding region is divided into five exons spanning more than 65 kb that codes for a polypeptide of 529 aminoacids. 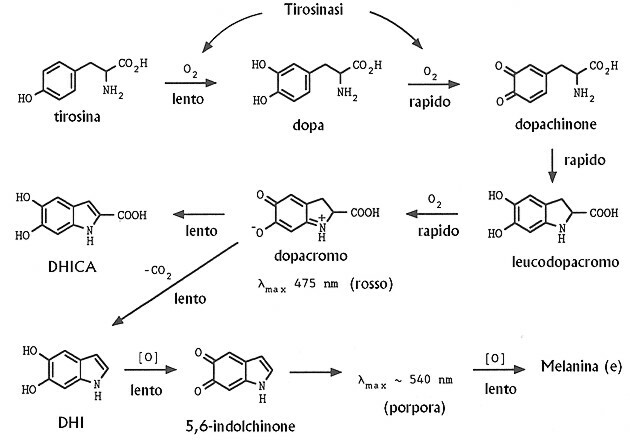 Tyrosinase is a copper-containing enzyme that catalyzes at least the first two reactions in melanin biosynthesis: the hydroxylation of tyrosine to L-3,4-dihydroxyphenylalanine (DOPA) and the subsequent oxidation of the nascent DOPA to DOPAquinone. 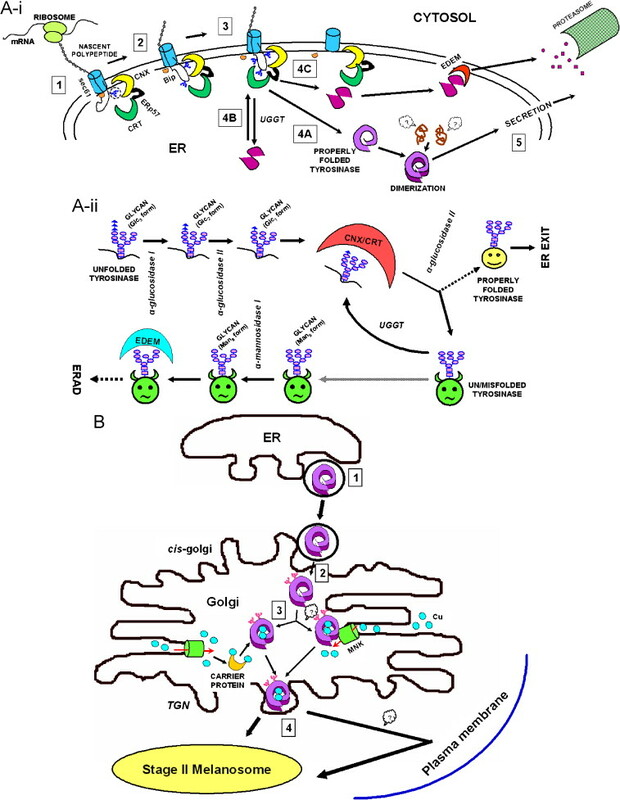 Schematic representation of TYR sorting through ER and Golgi. (2) calnexin (CNX) binding occurs when two trimmed glycans (Glc1Man9GlcNAc2) are added to the polypeptide chain and (3) calreticulin (CRT) binding is initiated with the addition of the 3rd glycan. (4A) properly folded TYR is homodimerized, although hetero-oligomeric interactions cannot be ruled out and (5) then the protein exits ER to reach Golgi. However, the un/misfolded protein re-enters the CNX/CRT cycle via UGGT (UDP-glucose: glycoprotein glucosyl transferase) (4B) and if still fails to fold correctly, is sorted out to the cytosol by EDEM (ER degradation enhancing—mannosidase-like protein) for proteasomal degradation (4C). Panel Aii demonstrates the role of glycan-trimming during the ER maturation of TYR. Different forms of glycans shown are as follows: Glc3 form, Glc3Man9GlcNAc2; Glc2 form, Glc2Man9GlcNAc2 and Glc1 form, Glc1Man9GlcNAc2. When the mutations of the TYR gene changes the correct sequence of the amminoacids of Tyrosinase, a mis/unfolded protein is producted and this has not enzymatic activity. So it is linked to EDEM protein and directed to the proteasoma where is degradeted. For this reason melanosomes can't mature and melanin is not produced. Mutations completely abolishing tyrosinase activity result in OCA1A, while mutations rendering some enzyme activity result in OCA1B allowing some accumulation of melanin pigment over time. Almost 200 mutations in TYR are known. As with all recessive disorders, the "mildest" mutation is determining for the phenotype. 1. Protection of the skin: melanosomes, containing melanin, distributes around the cell nuclei of the skin to protect them to UV Radiations. UVR infact can produce Reactive Oxigen Species that are involved in oncogenesis and produce the break of the folate into cells by photolysis. The folate is very important for the cell division. Melanin, overall Eumelanin, produces tanning, which is a mild sunscreen, protecting the skin from photodamage and cancer. 2. Protection of the eye: besides the role of pigmentation during ocular development, melanin also acts as a filter, by modulating the proper scattering of incoming photons to the eye, and protecting the retina from light-damage. 3. Correct Development: Melanin lets the correct development of the eye in particular of the Fovea and direct fate of ganglion retinal cell axons pathfinding, preventing the misrouting of the optic fibers. Reduced visual acuity can be helped in various ways. Clinics specialized in low vision will provide the expertise. Glasses, possibly bifocals, may often be of sufficient help. Photophobia can be helped with dark glasses or photocromic lenses that darken with exposure to bright light. Nystagmus may be helped with contact lenses. For strabismus it may be necessary to patch one eye in children to force the non-preferred eye to be used. Surgery can help patients with residual Nystagmus. In fact the amplitude of nystagmus diminishes as the child matures and in some cases may be detected clinically only as latent nystagmus with monocular occlusion in older children and adults. The main problem is that patients often develop an anomalous head posture to damp the nystagmus, referred to as the null point, where visual acuity is usually improved. When the head posture is sufficiently large and stable in amount, surgery can transfer the null point to a position closer to primary gaze with a extraocular muscle surgery (Kestenbaum-Anderson procedure). Another surgical procedure (retroequatorial recession of the horizontal rectus muscles) has been described to improve visual acuity in patients with nystagmus due to many etiologies. Most recently, tenotomy of the horizontal rectus muscles with reattachment at the original insertion has been introduced to improve visual acuity and calculated acuity function. The results are intersting and over the resolution of the Nistagmus, there has also been reported improvements in the visual acuity. Thanks to this some patient were allowed to obtain a driver’s license so surgery should at least be discussed with the patient, in addition to other potential methods to improve visual function. Some studies have reported interesting results which could open new frontiers in the treatment of the albinism. 1. Nitisinone improves eye and skin pigmentation defects in a mouse model of oculocutaneous albinism: Ighovie F. Onojafe, David R. Adams, Dimitre R. Simeonov, Jun Zhang, Chi-Chao Chan, Isa M. Bernardini, Yuri V. Sergeev, Monika B. Dolinska, Ramakrishna P. Alur, Murray H. Brilliant, William A. Gahl and Brian P. Brooks, 2011. This study examines the reaction of OCA1 mice to Nitisinone, an inhibitor of an enzyme of the catabolic pathway of the tyrosine. Administering Nitisinone in OCA1 mice, blood levels of Tyrosine increased, followed by a reprise of the pigmentation in OCA1B mice, there was a residual activity of Tyrosinase in. There was also an improvement of the visual acuity, directly collected to the precocity of the treatment. Earlier the treatment, greater the inprovement. 2. AAV-mediated Tyrosinase Gene Transfer Restores Melanogenesis and Retinal Function in a Model of Oculo-cutaneous Albinism Type I (OCA1): Annagiusi Gargiulo, Ciro Bonetti, Sandro Montefusco, Simona Neglia, Umberto Di Vicino, Elena Marrocco, Michele Della Corte, Luciano Domenici, Alberto Auricchio, and Enrico M Surace. This study has reported a reprise of the melanization and the production of eye pigment in mice cured with subretinal injections of TYR gene by a vector ( AAV2/1-CMV-_hTYR_ is a ubiquitous Citomegalovirus harboring the TYR gene).